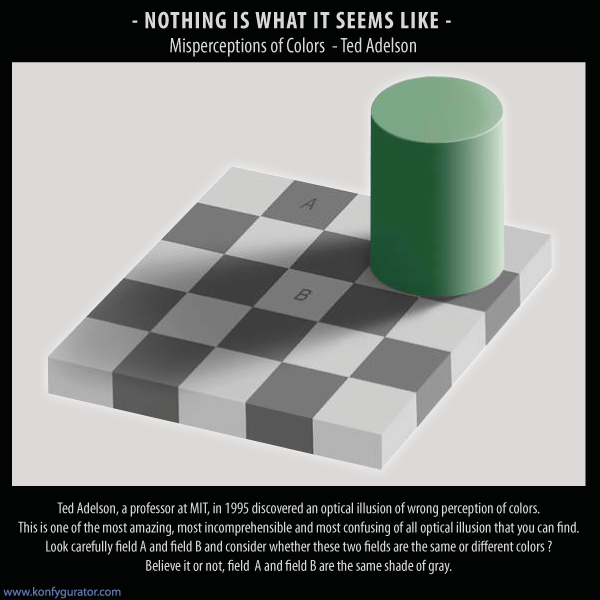 Ted Adelson, a professor at MIT, in 1995 discovered an optical illusion of wrong perception of colors. This is one of the most amazing, most incomprehensible and most confusing of all optical illusion that you can find. Look carefully field A and field B and consider whether these two fields are the same or different colors ? Believe it or not, field A and field B are the same shade of gray. If you do not believe me, open fotosop and see for yourself. Explanation of the wrong color perception, in essence, is simple and is that our brain puts color in a certain context. In this case, our brain takes into account the shadow that covers the fields B, and on the basis that determines the color of the field.